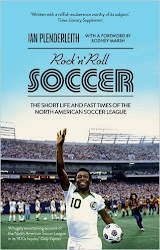 ROCK N ROLL SOCCER: "Marsh has overshadowed Pelé, no doubt about it"
Tampa Bay Rowdies coach Gordon Jago said of players like Rodney Marsh that “you have to accept them the way they are. Only a fool would try to submerge those assets.” Yet the 1970s were full of fancy-footed, flair players who were adored by fans but submerged by managers and clubs who couldn’t afford to let a single unruly player look bigger than the club, no matter how special his talents. Spurned by the tactically dull English game and the post-Victorian disciplinary norms of its custodians, many of the more individualistic British players found the North American Soccer League to be a far more receptive platform for their charisma-driven style, both as a footballer and a personality. Rodney Marsh stopped the game, although referee Peter Johnson hadn’t blown his whistle. The Tampa Bay Rowdies midfielder fell to his knees, stretched out his arms and gestured at the ball in his possession. Come and get it, he was saying to the New York Cosmos, a team that was losing 4–0, and whose pivotal player, Pelé, was not having his greatest day. Come on, come and get it – I know you can’t, but try anyway. It was the 1976 season, and the first visit by the Cosmos to the upstart Tampa Bay Rowdies since Pelé’s signing the previous year. The New York team, fresh off the plane from an exhibition game in the Dominican Republic, looked distinctly out of sorts, playing in front of a national TV audience and a regular-season League record crowd of over 42,000. They finished exhausted, outplayed, and soundly beaten by five goals to one. The talking point of the game was not, however, the exemplary hat-trick that Derek Smethurst put past New York’s hapless second-choice goalkeeper Kurt Kuykendall. 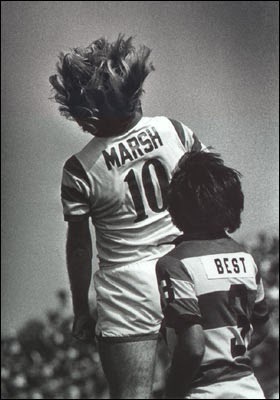 It was Marsh, down on his knees, taunting a team that featured the greatest player of all time. Loved the book! Is there any footage of Marsh's taunting? I've found a 3-minute recap of the game, but that bit's been left off.